You will have to forgive me for being so quiet here on my websites over the past few months, it would be easy to imagine that I have been sitting with my feet up watching daytime TV, enjoying the pleasures of Escape to the Country and Countdown whilst being fed and watered by my staff, lording it up after the book awards…. Nothing could be further from the truth (I have no staff anyway). I have in fact been so busy with different projects that I have had a four month sabatical from getting out and about on serious adventures either here in Teesdale or further afield. With the turning of a new page on the calendar I am now in a place where this self inflicted abstinence has come to an end and I can now venture out into the big wide world. This period of going without has given me a new vigour to get out and see the landscape with new enthusiasm, perhaps it was just what I needed, after all, having spent ten years focused on The Wainwrights in Colour I was confined to acheiving targets within the boundaries of the Lake District and the project constrained me in my painting and walking. Now I am once again a free agent, able to wander at will. 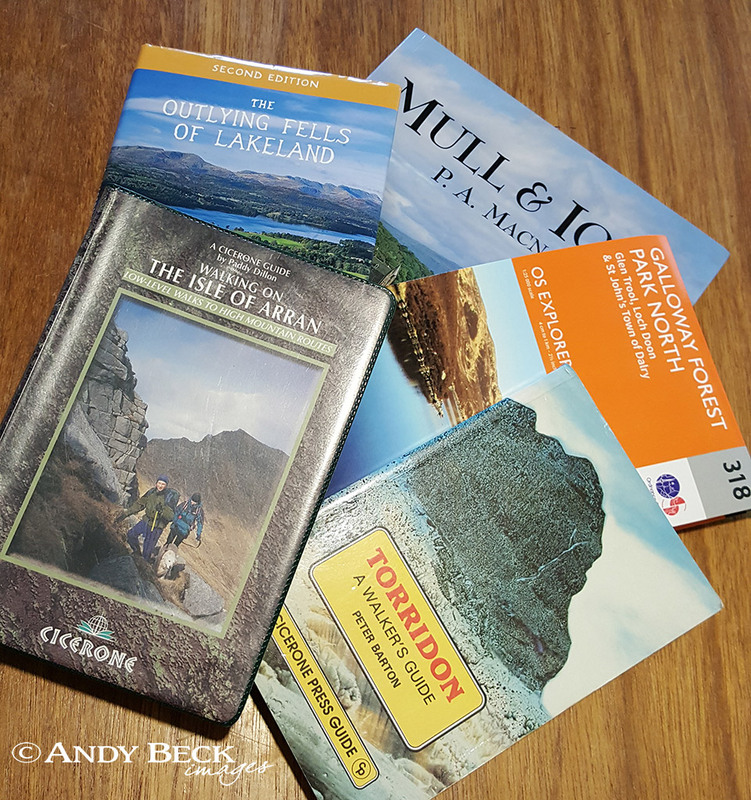 I have dusted off books, maps and guides for areas into which I haven’t journeyed for many years. Even though it is just over an hours drive from home Scotland has been “off-limits” for over 8 years- time for some catching up. But Scotland will not be my main focus, I have unfinished work to do over in the Lake District as well as here in the North Pennines, with two “projects” cooking away behind the scenes which will soon be revealed here on the pages of my websites. Teesdale will of course feature heavily in paintings, photographs and walks which will most likely culminate in an exhibition and book(s). As far as the Lake District is concerned, well Wainwright and I have unfinished business, he has got into my soul and I need to further expand on some aspects of that man’s work before I can lay my “Wainwright” connection to rest. Again, this work will be covered here on my website pages and should give a fascinating insight to how AW produced his guides and lists. If you wish to follow my progress on these new adventures then be sure to subscribe to this website to get regular updates delivered straight to your inbox. Best wishes for all your forthcoming adventures. Keep us all informed and we will be looking forward to the next Andy Beck production! Thank you Richard, The Wainwrights in Colour will be a hard act for me to follow but hopefully it will be interesting enough for you to keep in touch.